New research by the C40 climate leadership group and consultant Arup shows that world’s largest cities are taking more action than ever on climate change. Report and interview with lead author. The study “Climate Action in Megacities” published at the C40 Mayoral Summit in Johannesburg on 5th February comes at an important time. Cities around the world are dealing with a changing environment which has made them more vulnerable than ever, while at the same time the world is becoming increasingly urban and population densities are swelling like the rivers that many of them sit beside. It is therefore reassuring to hear that the largest cities around the world are accelerating efforts to reduce their greenhouse gas emissions and become more resilient to climate change. More than 8086 actions were identified by the new report compared to 4700 when the study was first carried out in 2011. “This is not a wish list, this is actually happening. Cities are doing more than ever to reduce emissions.” said Michael Bloomberg, President of C40 and former Mayor of New York at the launch of the report. Announcing the findings C40 executive director Mark Watts explained. “The report does a number of things, it tells us the number and scale of actions that cities are taking to tackle climate change. It analyses the powers that the world’s leading cities have to influence climate change actions and it identifies the levers of implementation used to deliver the actions.”Through this analysis the team generated many important findings including the fact that the scale of action being taken is increasing. Projects that were being piloted in 2011 are now becoming fully fledged schemes and this is particularly true for building retrofit, climate adaptation, waste, and transport. Building retrofit for example was the most active sector discussed in the report with 1668 measures underway – around 20% of the total. Cities are focussing on efficiency before local generation including better insulation of their buildings, making their heating and cooling systems more efficient and investing in more energy related data collection, audits and advice. Sydney for example is retrofitting 45 municipal buildings with energy and water savings measures that will reduce consumption by 6641MWh and emissions by 23%. The payback period for this is nine years. Melbourne too is even more ambitious with a plan to retrofit 1200 public buildings – a plan which made it winner of the C40 Siemens City Leadership Award for energy efficiency in the built environment in 2013. But as former US President Bill Clinton pointed out at his address to the C40 summit much more remains to be done. A stark reminder of the vulnerability of cities was served when it was announced that the Mayor of Rome Ignazio Marino was unable to attend the event as flooding and mudslides beset his city. Adapting to and tackling climate change is therefore vital and that cities are increasing their efforts is welcome. As Paula Kirk from Arup outlines in her interview with Infrastructure Intelligence, cities are sharing their best practice, supported by infrastructure professionals to help identify the replicable, practical and implementable solutions that can make a valuable contribution to cities of the future. Now is the time for cities to act. The United Nations Framework Convention on Climate Change (UNFCCC) is now working on a new Global Climate Change Agreement to replace the Kyoto Protocol which ends in 2020. A final agreement will be launched in Paris in 2015. Whatever the legally binding outcomes from this are one thing is certain: as the economic, commercial and population centres of the world cities must take the lead if climate change reduction targets are to be met. “Climate Action in Megacities” lead author Paula Kirk from Arup talks about the biggest study yet into how cities are tackling climate change. 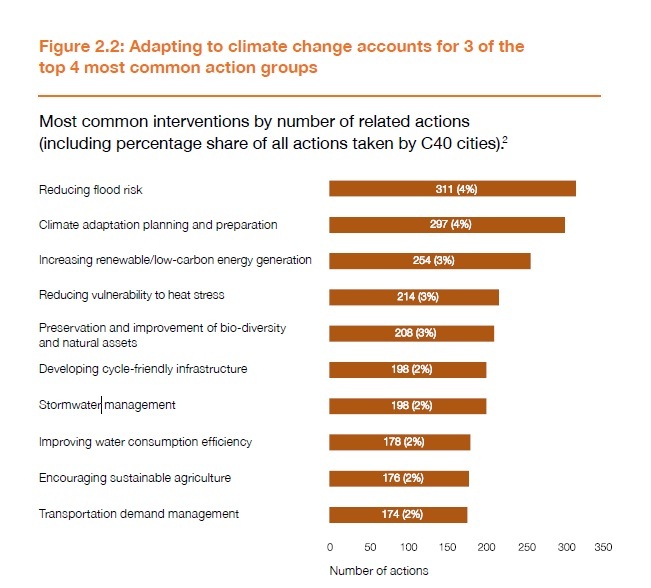 Why is the Climate Action in Megacities report important? This report is the largest collection of actions from cities around the world with 1.7 million data points collected to profile what cities are doing to tackle climate change. One of the key findings is that sharing of ideas really works, and that is one of the key benefits of the C40 cities group. What one city does has often been piloted in another city. For example the Mayor of Rio Eduardo Paes, who is new chair of C40, has been very open in saying that nothing that they have done is new. Mayors are taking examples and replicating them in other cities so they are sharing learning which enables them to accelerate the action that they take on climate change. What is role of consultants like Arup in that process? Arup’s role is very much about helping each city understand what developments of the different initiatives are replicable. What works in one city may not work in another. A fantastic example is bus rapid transit (BRT) and cities in the southern hemisphere are leading by example here and transferring this to northern hemisphere cities. South American and Johannesburg have great BRT systems in place. What Arup can do is understand the profile of those cities, what their transport needs are, what the congestion issues were, their infrastructure current situation and what modelling can be done to understand how you have that modal shift of people from car to public transport, whether or not BRT is the right solution, it maybe the tram, maybe a large Crossrail type infrastructure project. Understanding what is the right technical solutions is where Arup can play a strong role. 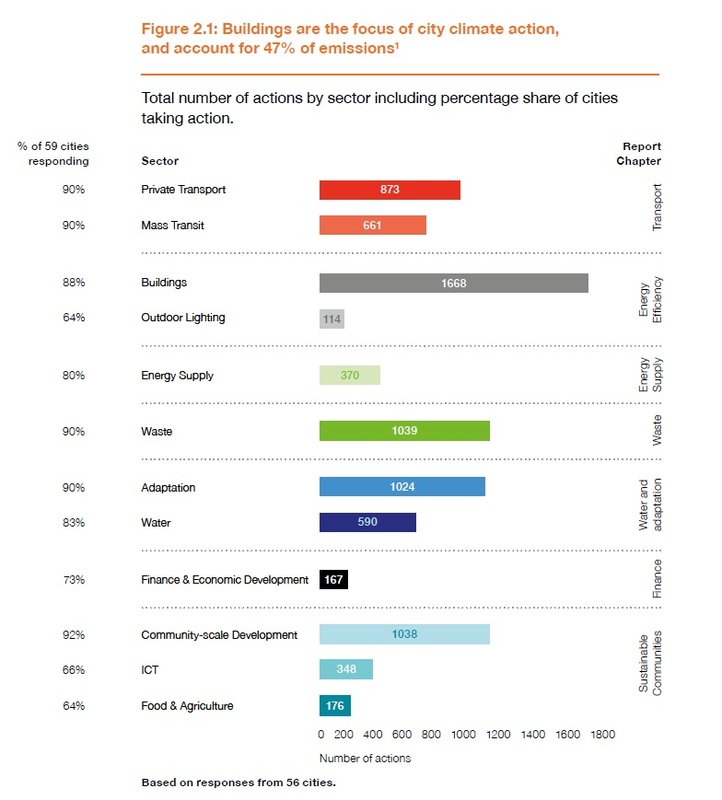 Transport was a key area where the report shows 1543 actions are being taken by C40 cities. What stood out from that? Mayors have quite strong powers over transport. Those direct powers can really help develop a scheme. Two thirds of all actions are happening on buses compared to any other form of public transport. For walking and cycling cities have a very direct role with things like place making, street signage, lighting, making sure pedestrian routes are safe. There is actually a huge amount more that we can look into on the social and behavioural side in terms of what incentivises people to use walking and cycling. Copenhagen have some fantastic examples that they reported on the percentage of people that cycle for business because it is more time efficient than any other form of transport in the city. They then were able to say that for every 1km cycled there is a direct reduction in public health costs of $1. Buildings showed most number of actions with 1668, what does that tell us? Building standards is where cities have a key role. Some are set at a national scale but what we are seeing is that cities have used local standards that are in excess of national government requirements and met with developers to develop housing that is to a higher standards and that has set a precedent for private sector developers to come in and develop to the same high standards. The key issue for cities is that they need to understand what the building stock is and how to appraise it. Certain cities like Berlin are saying that they have massive reductions in energy use but what works in Berlin might not work in another city because of the type of building stock. Understanding what is appropriate for each city is key. Where have you seen most progress since this report was undertaken in 2011? In smart technologies and adaptation Mayors have very little power but they have taken huge evasive action and that shows that they can be more innovative. Having power to directly influence something is one thing but innovation in those areas in particular is very, very interesting as they have done more than people might have thought that they could do. Where cities have taken it upon themselves to have a direct role in working with the private sector to increase the connectivity of their citizens and make sure that businesses have more access to wifi they are looking at the direct economic benefits of doing that as well. We heard from the Mayor of Johannesburg Mpho Parks Tau yesterday that the city is setting itself up as a place for business to relocate by pushing their connectivity, where that used to be focussed on transport and housing technology is a key issue now. What does the report tell us about where future investment in city infrastructure is headed? Cities are giving a very clear message that what they are doing across the sectors they want to do better and what they want to do is learned from other cities. A lot of adaptation related projects were in the pilot stages but were shown to be successful and cities are very keen to do more there and are investing in those successful pilots. Paula Kirk is the energy and climate change consulting group leader for Arup and lead author on the Climate Action in Megacities report 2014 published at the C40 Mayoral Summit in Johannesburg on 5th Feb.